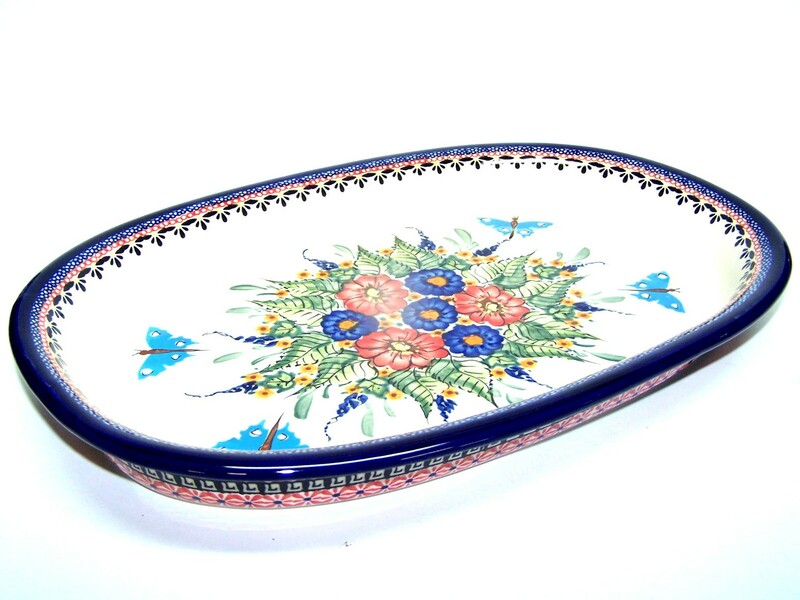 Polish Pottery UNIKAT Photo Serving Platter with Lid is ideal to be used as a serveware or a dinner plate. While the serving platter is great to serve stews or rice dishes; the added lid ensures the food stays warm and fresh for long. Made of hardened, handcrafted stoneware from Boleslawiec; it is free of toxic chemicals and great to use. Aftercare is equally easy as the Polish pottery serving platter is microwave, oven, freezer and dishwasher safe. The botany inspired, floral pattern lends a soothing freshness to the dining space. The part of signature UNIKAT collection, it is handcrafted by skilled artisans from Boleslawiec Poland and signed at the bottom for authenticity. • Dimensions: Approx 15.25" x 10.25" x 2 high - Polish Pottery "Stoneware"
• • To insure longevity of your stoneware, it is recommended not to put the piece too close to the heat source such as the broiler or bottom of the oven. A national treasure, Boleslawiec ceramics have been manufactured for centuries. Developed from natural ceramic clay that can be found near Boleslawiec at the Bobr and Kwisa rivers. According to historical sources, the first stoneware was made in medieval times and in the early 16th century, local potters formed guilds to ensure perfection. Zaklady Ceramiczne "BOLESLAWIEC" was founded by one of the original men with the first pattern dating back to 1759. “BUTTERFLY MERRYMAKING 15" PLATTER“ is a UNIKAT pattern based of the 300 year old pattern "EYE OF THE PEACOCK". Designed by top designer and imported by Pottery Avenue, the premier importer of Polish Pottery & Polish Stoneware.